It’s been 21 years since Johnny Thunders was found dead in a New Orleans hotel room; some say from drug-related causes while others point to foul play (his passport, clothes, and make up were gone). 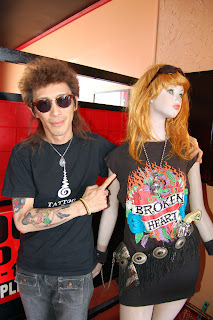 Known for his work with The New York Dolls and The Heartbreakers with the classic punk rock anthem as “Born to Lose” Thunders and I share one thing in common: we both have had tattoos done by legendary Thai tattoo guru, Jimmy Wong. In fact, shortly before Thunders died, he was in Bangkok getting inked by the legendary tattoo artist. 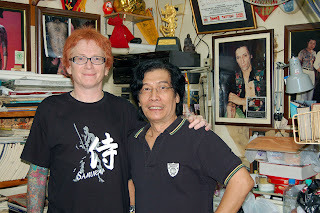 In 2004, I visited Jimmy Wong’s studio on Sukhumvit Soi 5 for the first time. 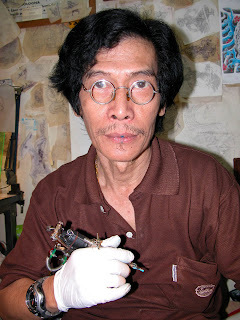 I had heard about this legendary tattoo artist before but had no idea of this Wong-Thunders connection until the night I got inked from Jimmy for the first time. While I was sitting in the chair, waiting for Jimmy to finish, a tourist from France stopped in. Of all the times I spent at the studio, there was always someone stopping in to pay a courtesy call to Jimmy. And on that March night in 2004, it was this man from France who stopped in to meet the man who tattooed Johnny Thunders and get a business card to bring back to his friend in France who was also a huge Johnny Thunders fan. Jimmy stopped tattooing for a few minutes to pose for a photo and then it was back to work. And if you happen to find yourself in Bangkok and in need of a tattoo from this legendary tattoo artist, look on the wall in Jimmy’s studio; you’ll see this photo of Johnny showing off his new ink. It was a cold, rainy November Friday evening when my Japanese friend, rock and roll and tattoo brother Kenny Shangrila took me to the Boogie Café in Yokohama. On my way from Bangkok to Chicago via Japan, I had a three-day layover in Japan where I would be hanging out with Kenny. After he had met me a Narita International Airport we hopped in his banged up and dinged white Datsun truck for the drive into Tokyo and Yokohama with Johnny Thunders blasting on the tape deck. Boogie Café. The name alone conjured up images of the 1970s of platform shoes, disco balls spinning from ceilings and The Bee Gees. However, nothing could be further from the truth when Kenny and I walked in there that November night three years ago. To be sure, as soon as I walked in, I felt as though I as though I had stepped back into time—back to some American diner in the 1950’s or early 1960s—judging from the posters, handbills, signs and other bric-a-brac adorning the walls and filling up every inch of space. It was the kind of place one almost expected to hear Bill Haley and the Comets, Buddy Holly, Gene Vincent, or Eddie Cochran coming from a jukebox if there was one. That’s okay, there’s plenty of classic rock playing on the sound system to satisfy any eclectic musical tastes. Knowing how much Kenny was a fan of Johnny Thunders, that’s what the bartender/cook/disc jockey played for us that night. I’ve seen a lot of that when I’ve been to Japan. The Japanese are keen to what is cool culturally, especially when it comes to rock and roll and nostalgia. One of the greatest exports to Japan has been popular culture that the Japanese know how market and enjoy. Back in 1989, when I was teaching English in Hamamatsu I went to this bar called The Ketchup Club—just down the street from where I taught. The owner modeled the bar after some bar he had visited when he lived in New York and everything was in English inside, down to the coasters and the napkins. He even had his friend back in New York record hours and hours of one radio station on a reel-to-reel that he played non-stop in the bar. You really did feel as though you were in bar back in the States, sipping imported beer, gobbling French fries, and listening to the radio. As for the rock and roll ambiance at the Boogie Café, it is not without precedence. Owned by Mr. Chibo a legendary rock and roll and blues guitarist, who is often referred to as the “Godfather of Japanese Rock and Roll” – when he’s not meeting customers at the Boogie Café, he’s out playing with The Mojos a popular Yokohama rock and roll/blues band. Even the menu was authentic that offered a standard fare of American diner favorites like burgers, and hot dogs served with a side of chips. Kenny suggested I order a burger and it was one of the best darn burgers I had tasted in a long time. Prices can be, for the lack of a better expression quite pricey in Japan, but not so at the Boogie Café where most of the food was a couple of bucks (under 1,000 Yen). He joined us at our table where Kenny and I enjoyed some Dad’s Root Beer and our burgers. Having just spent the past two months in Thailand, he wanted to know all about my trip as well as check out my latest ink from Jimmy Wong. Kenny and I had met in Bangkok that previous February at Jimmy Wong’s first international tattoo convention in Bangkok and again in September. Nothing beats talking shop when it comes to rock and roll and tattoos. The burger and the Dad’s went down well as did our conversation. It had gotten late, by now, Kenny had to drive back to Kofu (I would be staying in Tokyo) and we had a full-day planned for the next day (a visit to the Yokohama Tattoo Museum), so we bid farewell to Mr. Chibo; we would be back again soon. As for the Boogie Café, well that was what you would call a real Boogie Night. If you are ever in the Yokohama area and want a taste of what an authentic American diner has to offer, listen to some good tunes, and hang out with some cool people, the Boogie Café is a must. The café is located at Yokohama-shi, Naka-ku, Honmoku Makado, 20-1, Yokohama, Kanagawa-ken 231-0825. It’s small, so you might want to phone ahead (tel. 81-045-621-0990) to make reservations. I hadn’t given much thought to getting a tattoo when I joined the Air Force but when I got to Howard Air Force Base in the Panama Canal Zone in September 1976, my first duty station, I had a change of heart: three months later I was ready to be inked. What brought about this heart of change was seeing the ink that some guys in my barracks had done by a tattoo artist in Panama City. After I had seen their ink, which had been specifically designed for them, I thought it would be cool to have my own tattoo. And that’s exactly what I decided to do at the end of 1976. Actually, I was not the only one who was interested in getting some ink done. One of my best friends Howard, who I had met that previous summer at a military hospital in Denver (while we were waiting to get our yellow fever shots) and who was now in the same supply squadron as I was, had also been thinking about getting a tattoo after he had heard me talking about getting one. Once we had decided to get a tattoo, we went down to this tattoo shop, not far from the Buffalo Bar (which was off-limits to the military) a few nights before to select our tattoos. The tattoo shop was pretty drab-just the kind of hole-in-the-wall shop with its walls covered with a lot of flash of “old school” tattoos-that you would expect to find near some military base overseas. There were lots of eagles, panthers, tigers, anchors, hearts (with Mom written across them), Geisha girls, Mermaids, and dragons. As for our “first tattoos”-I had my heart set on a tattoo of a flag and Howard, hailing from Minnesota (not to mention his Finnish ancestry) was going to go with a tattoo of a Viking. We told the tattoo artist that we would be back in a few nights and would probably be wasted, so we didn’t want to make any mistake when it came to choosing our first tats. During the holiday season, our supply squadron gave us all a nice Christmas present by having skeleton shifts. I was off the week before Christmas and Howard had the following week off. Back then, most people only worked an 8-4 or 9-5 shift-probably one more reason why so many people had wanted to be stationed at Howard. On the night Howard and I were going to get our tattoos, Howard, who had been off that week, had already gotten an early start drinking with Lee (his roommate) and John, an airman who had recently arrived at Howard. I met up with the trio at the base NCO club and tried to catch up with them sucking down one rum and coke after another. It was the day before New Year’s Eve 1976, but you would have thought it was New Year’s Eve the way we were celebrating that night. After we felt that we had adequately prepared ourselves for a night on the town in Panama City, it was time for a quick bus ride that would take us out of Howard, past Rodman Naval Station, across the Thatcher Ferry Bridge (which spanned the Panama Canal) and finally the bus stop outside the Ancon Inn. The tattoo shop was located just down the street from the Ancon Inn and down another narrow side street to the right. While Howard and I went there to get our tattoos, Lee and John headed off to one of the more popular watering holes nearby to wait for us. When we got to the tattoo shop there were no customers inside so I went first. I sat down behind the wobbly wooden counter and rolled up my sleeve on my right arm. The tattooist used a toothpick and tattoo ink to draw the outline of the tattoo on my arm. Next, he sterilized the needle by dipping it in some rubbing alcohol and then lighting it with his Zippo lighter. The thought of getting hepatitis or some other jungle disease hadn’t even crossed my mind. A car battery that he had rigged up on a small shelf behind a chair that he sat on when he did a tattoo powered his needle-gun. Before he started to work on my tattoo, I had Howard run to a bar down the street to get me a rum and coke. Drank a lot of rum back then as well as Cerveza Panama. The buzz of the needle-gun was too much for Howard, who after bringing me my rum and coke, decided to stay outside as the tattoo artist began to draw the outline of the tattoo on my upper right arm. I could see Howard through the doorway holding onto a wooden utility pole as if he was going to pass out. He didn’t hold onto it too long-before he said something about wanting to join Lee and John-but promised he would be back. He never did come back. At first, when the tattoo artist started to do the outline, the pain felt like a stinging, burning sensation and reminded me of a cross between being stung repeatedly by bees and scratched by a cat. As for the tattoo artist’s technique, it sort of reminded me of when I was in elementary school and used the point of a geometry compass to gouge my initials and other acronyms on the wooden top of my desk. Not long after Howard had left, in walked a group of GI’s stationed at Fort Clayton, who just got in from two weeks of jungle training. They were all liquored up and itching to get some more ink done. As soon as they saw me and the little ink the tattoo artist had already outlined, I was fair game. Well, I was grimacing a little. Actually, it was more than a little, but I was not about to let these guys know what it truly felt like. “Hey, you’re not going to pass out are you?” asked another taking a swig of his Cerveza Atlas. “No, I am not going to pass out,” I replied gritting my teeth. Please don’t let me pass out. “If you think that hurts, take a look at this,” said another GI. He unbuttoned his shirt to reveal a large tattoo of a lion on his chest. “Hey, you want to step outside?” said Johnson, about ready to throw a punch. “Lighten up the both of you,” said another GI. “Would one of you guys mind getting me another rum and coke?” I asked. I took out a few damp, crumpled bills from one of my pockets and tossed them on the counter in front of me. It took a little over two hours to do the outline and then have it colored. I had a couple more rum and cokes and by then I wasn’t feeling too much pain at all. The GI’s from Clayton were impressed and even bought me a few of those rum and cokes. After I got my tattoo, I eventually caught up with Howard, Lee, and John at the Fox Hole Bar. They were all pretty well trashed by then but still wanted to see the ink I had done. “Let’s take a look,” said Howard. I rolled up my shirtsleeve on my t-shirt and removed the white gauze covering the tattoo artist had put on. Although the bar was dark inside and there were tiny beads of blood across the tattoo, they could still make out the design. “Maybe I’ll just have to go back there another time and get my tattoo,” said Howard sheepishly. “Yeah, that would be cool,” I said. Howard never went back, but I did, in fact I went back that same night to have another one, a small one inked on my left forearm and two weeks later, to have one done on my upper left arm. Twenty-one years later I would finally get around to having that smaller one (an airplane propeller with the initials U-S-A-F written above it) covered up, which would begin a tattoo metamorphosis or awakening of sorts that would take me to tattoo shops in Bangkok, Phuket, and Yokohama. As for that first tattoo, it has long since been covered up; however, the memory of it and that night in Panama City all those years ago has been permanently tattooed in my soul. 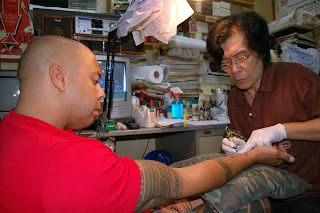 I got my first tattoo in December 1976 when I was serving in the U.S. Air Force in Panama, but it would be over 20 years later before I would get some more ink done and another eight years before I would meet the Thailand’s legendary tattoo artist, Jimmy Wong. I wrote this a few years ago (it was two different posts) and thought I would edit them into one. If there was one name synonymous with tattooing in Southeast Asia it would have to be Jimmy Wong who has been pushing ink and leaving behind a legacy of tattoo stylings for over 35 years. I first stumbled across Jimmy’s shop in Bangkok in March 2004 by chance when I was looking to have some ink done while I was on holiday. Back then I was thinking about getting a tattoo when I was in Bangkok (I already had plans to get one in Phuket) and when I spotted his sign outside his shop on Sukhumvit Soi 5 (I was staying at the Bel Aire Princess at the end of the soi) I stopped to take a look. It was early on a Sunday morning and when I peered into his dark studio, I could see a man who appeared to be busily drawing a sketch for a tattoo design. Little did I know at the time that the man was Jimmy Wong, one of the more famous tattoo artists working in Bangkok, not to mention Southeast Asia. Only later did I find out from his daughter Joy, who also does tattoos (a very good tattooist in her own right) and has a shop just around the corner from her father’s that Jimmy only works at night. I would have to come back later that night. Actually, I had heard about Jimmy before I went back to his shop that night. Years before, while getting “inked” at a tattoo shop in the Bangkapi Mall, the tattoo artist “Ton” (pronounced like “tone” with a harder “d” than a “t”) told me that there was a famous artist working in Sukhumvit; I didn’t put the two together until I actually met Jimmy later that night. Jimmy’s tattoo shop which is located behind a 7-11, just off Soi 5 is like most of the tattoo shops that I have seen in Bangkok—very small and crowded. He’s had a couple of shops in Bangkok before moving to this present location, which is pretty easy to find. In Jimmy’s case, over 30 years of tattooing has made him one of the more sought after artists for people looking to get inked when they are in Bangkok. Go to Jimmy’s shop any time and you are likely to see people from all around the world stopping in either to say high or to get a tattoo from Jimmy. If someone is in Thailand on holiday and they have heard of Jimmy, you can be assured that they will stop in and see him. One night back in 2004 when I was getting one of my first tattoos from Jimmy a man from France stopped in. He wasn’t interested in getting a tattoo; he just stopped in to pick up one of Jimmy’s business cards for a friend back home who had heard of Jimmy. Turns out, this friend back in France had heard that Jimmy had once tattooed legendary punk rock icon Johnny Thunders in 1991 and wanted one of Jimmy’s business cards. Thunders was Jimmy’s most famous customer. It was also to be Thunders last tattoo. A few weeks after he had gotten that tattoo, Thunders was found dead in a New Orleans hotel room. Perhaps a little history of Jimmy Wong is worth sharing to know more about the man and his art. Jimmy got started tattooing back in 1971 during the Vietnam War. It was by chance, in Jimmy’s words during an interview in 2004 with this author, how he came to get interested in tattooing. He had been watching this Chinese tattoo artist do tattoos and decided that was something he wanted to do. Later, this same artist become Jimmy’s mentor and taught him the craft. Jimmy would later hone his skills by tattooing U.S. service members at an air base near the Thai/Laos border toward the end of the Vietnam War. I suppose if one was ever to become good at their craft, it has to be someone like Jimmy who would go on to do countless tattoos for these service members. Old school (Sailor Jerry, Don Hardy) New School (Paul Booth) Tribal, Japanese—it makes no difference to Jimmy who can take any design someone gives him and transform it into a work of art. What’s most interesting about Jimmy is that he only works at night. I once asked him why he prefers to work at night and he told me that he works better at night because there are not too many distractions. When I’ve gone to his shop to have work done, I would usually get to his shop right around 10:00. If Jimmy hadn’t arrived at his shop yet, I usually hang out at this small coffee shop near the entrance to his shop or in the lobby of the Fortuna Hotel. The hotel is one of those hotels, which have definitely seen better times, and now, the terms seedy and sleazy seem more apropos. Jimmy is supposed to get to his shop around 10:00-10:30, but it usually ends up being later (if you are thinking about getting inked, make an appointment and call a few times to reconfirm). Most of the time he already has an appointment or two lined up for the evening. In the past, when I knew that I was going to be in Bangkok I called and booked a few nights just to be on the safe side. On one such hot, humid night, Jimmy was running a little late. I order some coffee at the coffee shop and sit near the front so I have a view of the street as I wait for Jimmy to arrive. There’s a steady flow of people walking up and down the street on their way to this sports bar across the street or the 7-11. I am about halfway through my coffee when I spot Jimmy walking down the sidewalk. Jimmy sees me immediately and waves as he continues toward his shop. By the time I get to his shop a few minutes later, Jimmy was already at work preparing his machines and ink for this session. His workspace is a bit cluttered with designs of tattoos he has done or will do hung up around his desk; some taped to a desk lamp over the desk. One of the first things Jimmy does when he comes to work is make himself a cup of coffee, light up a cigarette and then get his machines ready for the evening. Of all the times I have been there no one has ever walked in and gotten a tattoo without an appointment. Although he has a large sign out in front, he doesn’t seem to get a lot of people walking off the street to get a tattoo. From time to time there might be someone “who is thinking about getting a tattoo’’ after a night of drinking and checking out some of Bangkok’s steamy nightlife, but Jimmy usually sends them on their way. After tattooing for as long as he has, Jimmy can easily spot someone who is really interested in getting a tattoo or not. This night it is some young American clutching a bottle of whiskey who staggers in with his Thai girlfriend and asks Jimmy (in very passable Thai) about a tattoo. Jimmy is working on a “Thai” style tattoo (similar to images you would find in the Ramakien) on the inside of my right arm and tells the man to come back later. Chances are he won’t come back that night. Even if he does, Jimmy will tell him to come back the next night if he is still interested in a tattoo. Ever since then I have been the recipient of a trove of Jimmy’s tattoo stylings created especially for me. From a mythical Chinese-style lion and Japanese Geisha to some cover-up work (what was I thinking when I got those other tattoos?) and a more ambitious undertaking—a traditional Thai-style design on my chest—Jimmy has left his own tattoo legacy on my body. One of my personal favorites that Jimmy has done is the one of a Thai Mermaid, a mythical Thai-style design on the inside of my right arm. I had all these oriental-style tattoos already—koi, tiger, dragon, and two Japanese Geisha, but what was missing was a Thai-style tattoo. I wanted something special that would be uniquely Jimmy Wong. And that’s exactly what I got. Jimmy is famous for these kinds of tattoos, which he has often told me, are quite hard to do given the intricate detail of these designs. The outline took nearly five hours to do and it took just as long to color it in. We still need to add some background highlights, which will also incorporate some more Thai designs like lotus and water. 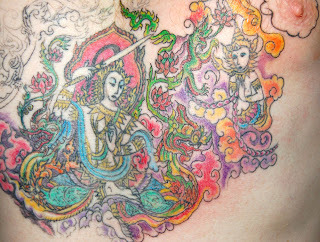 Since then, Jimmy has done a few more Thai-style designs including the outline of a major chest piece of mythical characters from the Thai epic poem Ramayana all of which are a testament to his tattooing expertise. It’s been a year since I last was at his shop and having some more ink done. I am not sure when I will have the chance to go back there again. I hope soon. My body is just itching for some new ink. And I also miss seeing my old friend. Once, when I was at Bangkok’s Don Muang airport in the departure lounge waiting for my flight back to Seoul, a fellow traveler sporting some ink took notice of the tattoos on my arm—one of them a most recent addition from Jimmy. “Looks like something Jimmy Wong would do,” he said. Think before you ink in Korea? If you are thinking about getting inked in Korea, you might want to think twice unless you want to land your tattoo artist in jail. I have often heard that tattooing is illegal in Korea, but I didn’t know that if a tattoo artist was caught they could face life imprisonment. “At 1 p.m. on June 22, a street art performance was underway in a Seoul park, where tattoo artist Lee Rang, 30, was putting the word “revolution” and a peace symbol on the back of 26-year-old cook Byeon Gyu-du. Passers-by stopped and watched the tattooing operation with interest, but 10 minutes after it started, police suddenly rushed up to intervene. “Don’t you know it is illegal to do this?” asked one of the police officers. Lee was taken to a nearby police station and charged with violations of medical laws, which regard tattooing as a kind of medical activity. Gee, don’t you think that is a little stiff for some ink? Sure, there are tattoo shops in Korea, especially around some of the military bases, but I guess some people would tend to look the other way if the tattoos are intended for military personnel. It’s a quiet May Friday night in Bangkok (the first time I have ever been in Thailand during the month of May) and I am back sitting in my favorite chair at Jimmy Wong’s tattoo studio. I say my favorite chair because I have spent many nights in this chair getting inked by Jimmy. Three years and countless late night ink sessions I have come here for Jimmy to work his magic. Like some gravitational force pulling me—as soon as I walk down Sukhumvit Soi 5 and turn down the small passageway which leads to his studio—the chair awaits me as does the needle gun and ink. 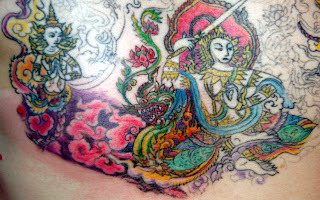 I am only in town for a few days, but at least I will be able to squeeze in a few hours for Jimmy to add some more ink to the Thai-style chest piece he started to do for me a year ago. It’s a little strange only having Jimmy do a few hours this time, but that’s okay. I will be back here again in July. It’s good to see Jimmy and catch up on the past couple of months. Jimmy always tells me that I am part of the Wong family and that is how I feel whenever I am back in his studio whether to get some ink done or just talk. The last night I was here was in November right before I flew to Japan and then back to the States for two months. Back then I didn’t know where I was going to end up—whether I was going to be in Thailand or back in Korea. Well, I ended up back in Korea and although I don’t have the kind of vacation time that I had before, when I do, you can be assured that I am going to be right back here in my favorite chair having Jimmy finish up the ink stylings he has created for me. Without question, Southeast Asia’s most famous tattoo artist who has been leaving behind a legacy of tattoo stylings (and inflicting a little pain along the way) for over 36 years. Even if you haven’t been fortunate enough to get inked by Jimmy, you have most likely have heard about him if you are a tattoo enthusiast—either from someone who has gotten inked by him, or someone who visited his cramped studio on Sukhumvit Soi 5 in Bangkok. I am not surprised by the number of hits my blog gets every day from people doing a Google search for Jimmy Wong. Nor does the number of people who write to me personally after visiting my blog wanting more information about Jimmy and how to contact him surprise me. After all, if you’re going to be travelling in Thailand and you’re thinking about getting inked, it is definitely worth your while to make a special effort while you are there to get that tattoo from Jimmy. Looking back now, that first tattoo from Jimmy changed my life forever. It was not only the beginning of our friendship, but it also brought me in contact with many people from around the world who also have the same passion for tattoos and who have heard of Jimmy. Aside from someone stopping in to get inked by Jimmy, many times it was a tattoo artist traveling in Thailand who had to stop in and pay Jimmy a courtesy call. Other times, it was just someone who had heard of Jimmy and his work, like the one guy from France who had to stop in and meet the man who had inked Johnny Thunders for the last time. 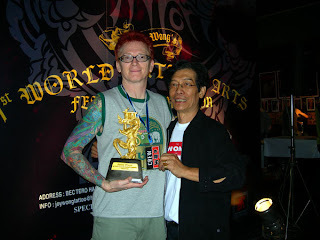 Then there was Jimmy Wong’s First World Tattoo Arts Festival and Exhibition in February 2006. 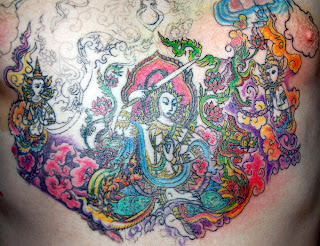 Again, if I hadn’t stopped in at Jimmy’s shop that March night in 2004, I would have never flown to Bangkok for the weekend to attend the Tattoo Festival, would have never gotten my first Japanese-style tattoo and win a tattoo contest and would have never met Kenny Shangrila who is now my best friend. And to take it one step further—and keeping with the “theme” of this blog—if I hadn’t met Kenny, I would have never gone to Japan last November and would have never met Horisei and Yuuki. Yeah, “One Night in Bangkok” changed everything. After a cool, wild, rockin’ night at Club Doctor, a two-and-half-hour drive to Minami Alps, and a few hours of sleep Kenny and I were back on the road to Yokohama for me to get inked by Betty. Before we hit the road though, we made a brief stop in Kofu so Kenny could show me his new tattoo studio, which opened last month. 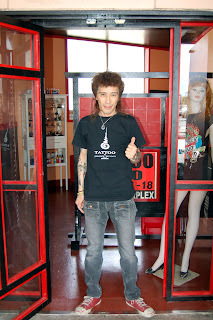 Although Kenny had been tattooing out of his country studio in Minami Alps (about a thirty-minute drive to Kofu) for the past two years (and up until last year at his studio in Shibuya) he decided earlier this year to open a studio in Kofu where he has built up a reputation as one of the better tattoo artists working in Yamanashi Prefecture. While Kofu pales in comparison to the excitement and energy of Shibuya and Yokohama (where Kenny also had a studio in the past) it’s a good move on his part to build on this reputation that he has made for himself here. It’s also in a pretty cool location between the House of Style (a vintage clothing store) and a club owned by the same owner of the clothing store. 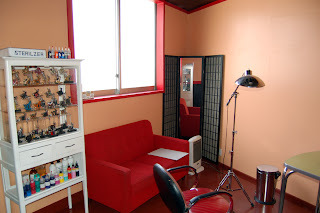 Although the majority of tattooing in Japan is done by appointment only the location of his new studio is ideal for people to check it out on their way to House of Style or the club in the evening. 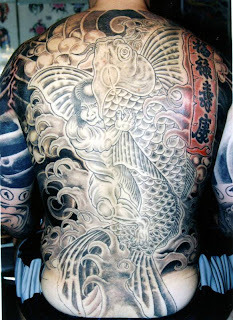 On the other hand, it might be off the beaten path as it were for foreigners who might be looking to get inked while visiting Japan; however, if one is looking for a unique tattoo in the Old School Sailor Jerry or Don Hardy tradition, it is definitely worth the trip to Kofu to get inked by Kenny. It’s really easy to catch a bus from Narita or Shinjuku Station to Kofu Station and once you arrive there is local bus service or taxis to Kenny’s studio. His studio might not look like much now in terms of décor (he is still in the process of adding many of his photos and other mementos that he had in his country studio) but the studio is open for business and since last month he has been quite busy tattooing customers. I am really happy for Kenny that he has a new studio and a chance to build on this reputation he has made for himself as a tattoo artist in Japan.